Congratulations to Suzanne White – our Day #3 Boxing Week Blow Out Lucky Winner! YAHOOOOO!!!! A huge thank you to all of our fans for all the love and support through out 2017! To say thank you we are giving away THREE – $200.00 surprise scrapbooking packages!!!!!!!!!!!!!!!!!!!!!!!!!!!!!!!!! These boxes are packed with scrappy LOVE! YOU ARE GONNA LOVE IT! 1. The contest will run for 5 days. 2. Enter as many times as you want! Contest closes Saturday Dec 30th at Midnight. We will randomly drawn 3 lucky winners and announce the winners on Sunday Dec 31st! Good luck everyone and THANKS AGAIN for all your love and support through out the year! All 3 days done. Happy New Year everyone! Thanks for the fun giveaway! I shared today’s post. Happy New Year! liked and shared. Thanks CSM – reading the winter issue now! This is as much fun as an advent calendar! Surprise package!! Have I mentioned how much I love surprises. Thanks C S for being sooooo generous. Shared this as well. Day 3 shared! Thanks again CSM! Shared again today. Fingers cruised for luck. Thank you. Shared and good luck to everyone! Thanks again for this amazing chance to win and Happy New Year to you and all your readers! Shared the Day 3 post – getting even more excited! Shared ! This would get me scrappy heart thawed out ! Good morning and thanks Day 3 shared!! SHARED! So excited about this bonus gift 🎁 package! S H A R E D ! Very exciting. You gals always put together the best prize packs. Shared day three correct email. Shared!! Thank you for the opportunity!! Shared again! Thanks for the chance to win! Shared – fabulous day 3!! Day 3 SHARED, thank you! Looking forward to new products in the new year! Shared and commenting. Thanks CSM! Shared. Thank you for another awesome giveaway. Our family loves scrapbooking so this would be great for us. Shared Day 3 – Thank you for the chance to win. Day 3 shared! Thanks CSM! Shared…thanks again for the wonderful prizes. What a fantastic win this would be!!! Day 3 of awesomeness shared!! Happy holidays!! Shared on day 3, with love for CSM! Shared again and I love to do it! SHARED!!! Again!!! What an amazing prize! Thanks so much for the opportunity! Shared! I would love to win! And I agreed the three days too!!! :Liked and Shared. Thanks again for opportunity. Happy New Year to everyone at Creative Scrapbooker and alll its fans. This is my correct email address. Typo in the original post. Shared and thanks for the chance. Tis a good Scrapbooking day in chilly Alberta. Shared! Thanks again and Happy New Year to everyone at CSM!! SHARED! Thanks so much for the chance to win a great prize! Shared!I will keep on trying. Thank you for the chance. Here we go again. How exciting! SHARED! Shared. Thanks for having such great prizes! Day 3 shared, thank you so much!! Shared, thx for this op to win. Hello again Creative Scrapbooker Magazine. I love your magazine and all the other great things you do for us crafters out there. Wishing all a very Happy New Year. Shared! Thanks for another chance to win! Liked, shared. Would love to win. Shared. This would be amazing. 3 is my lucky number…… keeping fingers and toes crossed. Happy new year!! All the best in 2018!! Another great prize. A perfect way to end 2017. I love surprises. What a fun contest! Shared and thank you so much for the chance to win some crafty goodness. Happy New Year! Thank you for the awesome prizes. Shared and loving a chance! Definitely shared on FB with all my crafty friends! you all a Happy New Year!! Ahh, Thank you so much! I shared! Shared! Thanks for this awesome opportunity to win! Liked and shared! Happy New Year! Wow, another chance to win a box of goodies!!! Thanks so much for all the extra post Christmas fun with the contests!! Great gifts! Just had to share! Shared! Thank you for the chance to win! I hope you had a magical Christmas , and that the New Year to come is filled with wonderful CSM memories! I luv C. S. M. sooooo much! Day 3 shared and a tad late due to intense migraine. Hope it still counts, because I would truly love to be elegible for this prize. Day 3 is shared, but d a tad late due to intense migraine. Hope it still counts, because I would truly love to be elegible for this prize. Shared!! This is a fantastic contest!! Thanks for a chance to win!! Shared Day 3 on Facebook. CSM, just want to say thank you for such a great magazine and website full of knowledge! This is an awesome prize to start the New Year creatively! I would love to win. Good luck to everyone. So excited for draw day! Day 3 shared! I hope I win! Sure could use this prize! is saying….oh no! You again! Super awesome! Thanks for a chance! Good luck to all! Thank you CSM for offering such a great prize! Shared! Thank you for the chance to win. Happy New Year! HAPPY NEW YEAR. It’s close. SHARED! I shared! Thanks and Happy New Year! Fun, fun and fun!!! SHARED!!!!! 12-28-17 Shared. Oh I hope the powers from above help select me! Shared shared and shared!! Awesome giveaway!! Shared. Thanks again for this wonderful contest!! Thanks again for this awesome giveaway!! SHARED…….Love the opportunity to enter this contest….oh what I would do with a prize package if I were to win!!! My mind is already gone wild with project ideas. Thanks for the bonus contest! Wow – day 3 – 2017 coming to a close this would be an awesome way to end the year!! Shared your info! Thanks for the chance to win great prizes. Shared again since I haven’t t seen a day 4 post on the blog yet. Thanks again for doing this extra contest!! I would be thrilled beyond words to win ! Thank you! SHared! Thanks for the chance to win this amazing prize! Wonderful prizes! You are so generous! Shared. 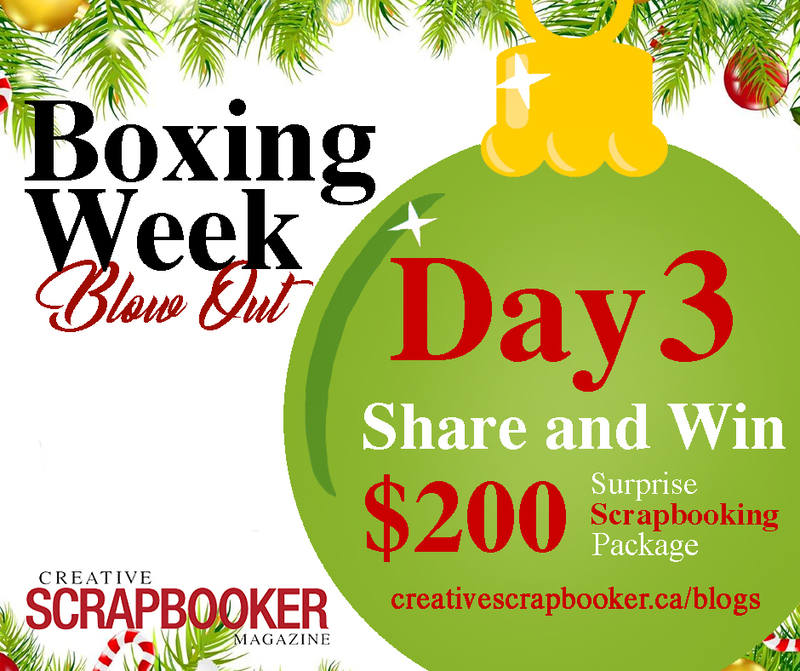 Shared and thank you for the chance to win the surprise scrapbooking package. Totally excited….Shared this one too. What great prizes you have! Good luck everyone! Shared. Hoping everyone has a fun and safe (and keeps warm) on New Years!!! Shared and posted. Thanks Jackie and Happy New Year. Shared!!! Thanks!!! For a wonderful year of creativity!!! Thanks for the chance to win again!!! Day three shared! Many many thanks for the opportunity. Love how you have shared. This is so awesome!! Happy new year!! Thanks so much for this great opportunity to win an awesome surprise prize!! Day 3 shared. . Happy New Year! Shared on FB! Amazing opportunity!! Keeping my fingers crossed! Shared as would love to win this awesome prize! Thx CSM!